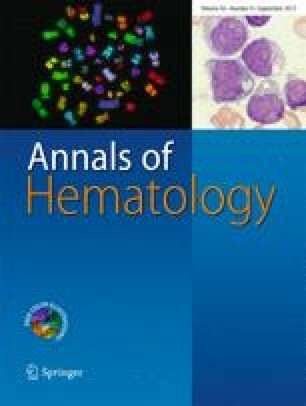 There is good evidence that T lymphocytes play an important role in the graft-versus-leukemia (GVL) effect following allogeneic bone marrow transplantation (BMT) for hematologic malignancies. However, the role of natural killer (NK) cells in GVL is less clear. To further investigate a possible association of NK cells with GVL we studied 15 patients undergoing BMT for chronic myeloid leukemia (CML), correlating T-cell (CD4+ and CD8+) and NK-cell (CD16+56+) recovery with relapse and graft-versus-host disease (GVHD). Patients were studied on three occasions up to 9 months after BMT, for lymphocyte surface phenotype and for spontaneous and IL-2-stimulated (LAK cell) cytotoxic function. Circulating CD8+ and NK but not CD4+ cell numbers were significantly lower in five patients who relapsed compared with those remaining in remission after BMT (mean 0.03 vs 0.32×109/l, p=0.002 for CD8+ cells; mean 0.03 vs 0.11×109/l, p=0.002 for NK cells). There was no correlation of CD4+, CD8+, or NK cell numbers and development of grade-II or more acute GVHD. Spontaneous NK cytotoxic function rose to within the normal range in the first month after BMT. LAK function remained low during the study period. These results link NK cell recovery more closely with a GVL than with a GVH effect.